Olivia used the adorable Birthday Mae from Some Odd Girl. I love how Olivia colored her hair to match the colors in the Designer paper she chose! That flower with the cupcake bling center is so cute! Love it! After last week...I could use a cupcake or 12 myself - LOL! Sensational Sunday Inspirations + CANDY! This is my new little nephew Jaxsyn! 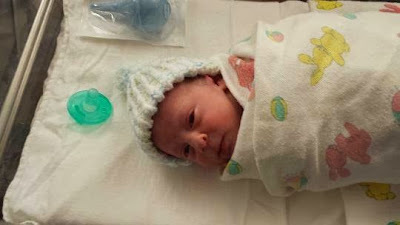 He was born yesterday :) He is a little guy - only 6 lbs 5 oz and 19.5" long! Congratulations to Debby4000 who said: Absolutely adorable and gorgeous too. Congratulations Debby! You're name will be in the $20.00 Gift Card Drawing on October 6th!! For my project I thought I would share my Secret Release project that I created for the September New Release for Crafty Sentiments Designs. I have had quite a few people ask if we will be getting the new releases in the store and the answer is YES! 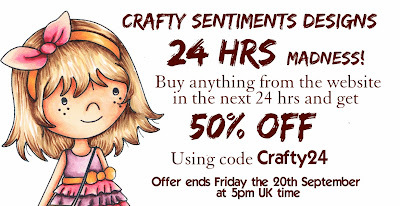 I do plan on getting ALL of the Crafty Sentiments Designs images that we can carry in the store, listed as a Preorder. That way we make sure we are ordering the customer requests first because there have been quite a few new ones since our last order! So look for those this week! I was given the super cute Space Walking image for my project. Now this probably dates me, but just remember I am 29 :) ... when I was little one of my favorite candy treats to get when Grandpa took us to the store was Pop Rocks. When I saw this image I thought it would be cute to make a little Pop Rocks Wallet! 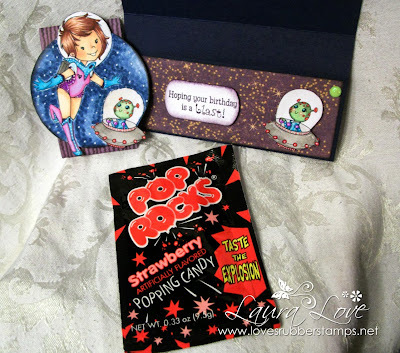 Pop Rocks are getting harder to find now, but you can still find then at convenience stores and sometimes around the holidays in the bigger stores. You will want to place your Designer Paper on the Inside Flap FIRST, then place your two Brads to hold the flap shut, and then place your back cover Designer Paper on. That way the back sides of the brads are covered. Fold around and secure. You can mount your image to the Belly Band. Be sure to check out what the other Designers have for you today ! Don't forget to leave comments on all the blogs for the most chances to win to be in our drawing on October 6th!! Enjoy your Sunday and thanks for stopping by! I am so excited about today's Video Tutorial from our Design Team Member Indah! I love this tea bag holder! 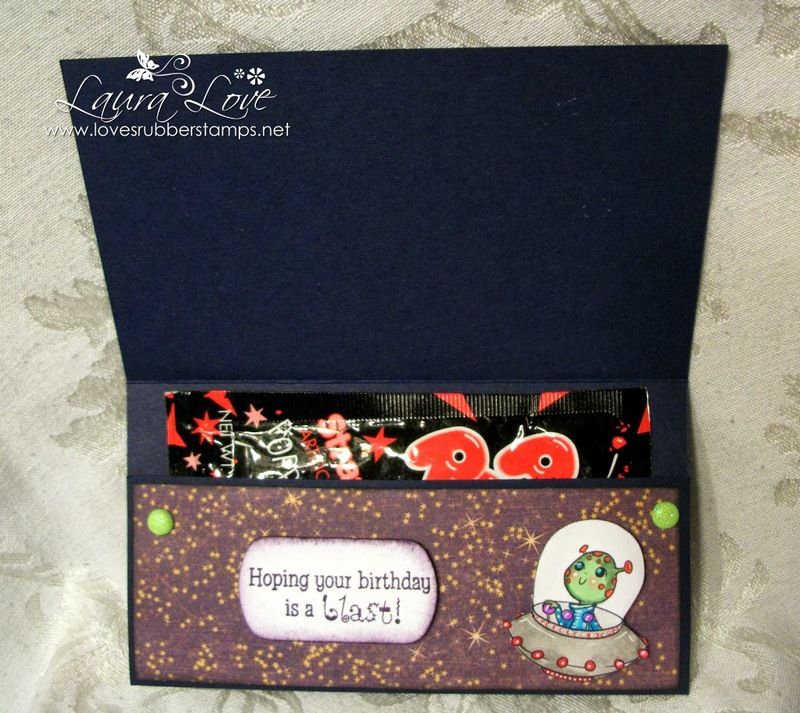 Your could also use it for gift cards and what a fun way to give them! Ah Ha! That's how to make the flurry super fluffy looking! lol. Please join us tomorrow for our Blog Hop! Thanks for looking in on us today. Welcome to a Happy Holly-Day Friday! Boo-Ya! I survived this week and it was a longggg one! Fortunately for me, so is my weekend! Whoo-hooo. High Five! Okay, enough celebrating, lol. For my Inspirational Post, I have a Tiddly Inks Image Called Too Cute To Spook. Yes, tis the season of witches and let me tell you, I have a few of them, lol. I love cute little witches, they make me so happy. 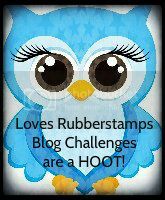 Have you been to the Home Page of the Loves Rubberstamps Store? Look who's featured, It's Tiddly Inks! A whole brand new supply has reached the doors and you are going to have such a hard time picking out which ones you want. Not only are they adorable, they also are a lot of fun to color and just the perfect size for most card designs. LOVE them! I was jumping for joy to see them added. I don't know what it is, but I am loving the purple dresses, green faces, black hat and straw hair this year, lol. I still have some Chillingsworth paper from last year and I was excited to see one in the store so I could use it on this card. If you missed out on this paper last year, hurry - hurry, before it's all gone! So this weekend I want to spend one day getting inky and one day watching football! lol. Wish me luck! I just celebrated with the 49er's finally finding their groove. Should be an interesting season now. lol. How about that Gore rushing all those yards! He is my hero! And for those of you not watching football, take advantage of the all day Sundays! lol. Plenty of time for those big projects you have been wanting to do. So don't forget the 12X12 papers too! Thanks for Looking in on us and I hope you have a fabulous weekend! Wow, I love the beautiful paper and the fabulous design. The colors and the cute image are so great.! Fabulous Ceal, thank you! I don't know about you all, but it's been a very long week for me and I know for Laura as well. I hope you have a chance to get inky and can join us over at the Challenge Blog this week where we are asking you to show off your fall colors! We have a Fabulous sponsor, Kenny K and Laura has just added a bazillion new Kenny K images to the store! I know this has made the design team very happy, these images have something to offer everyone! Look at this adorable layout that Olivia has created! I love the designer paper and the cute School set logo's she used together. What a fabulous layout and design. The colors are perfect! I still have the pictures loaded on my phone from my little ones first day of School ever and he is ten now, lol. I do feel more inspired to get in there and get some done now. Thanks so much to Oliva for the Inspiration, this is fabulous. 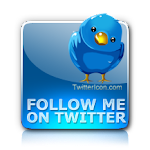 Busy evening here after work today, so I am going to blog and run, lol. Hope you are having a great day and can join us for our challenge tomorrow! Congratulations to Rachel Parys who said: Totally cute! You rocked this square challenge! Thanks for joining the TGF challenge! Congratulations Rachel! You're name will be in the $20.00 Gift Card Drawing on October 6th!! With me crazy schedule this week I didn't have any crafty time so...here is a coupon for you instead! SAVE 25% on your order... when you spend $25.00 or more! Walking Tessa - Sneak Peek! I decided to color my little piggy black because I wanted to be a little bit different :) A lot of the little pot bellied mini pigs people get as pets are black so little Tessa will fit right in :) I remember when I was teenager I wanted a little mini pot-bellied piggy for a pet but my Mom never would let me - LOL! 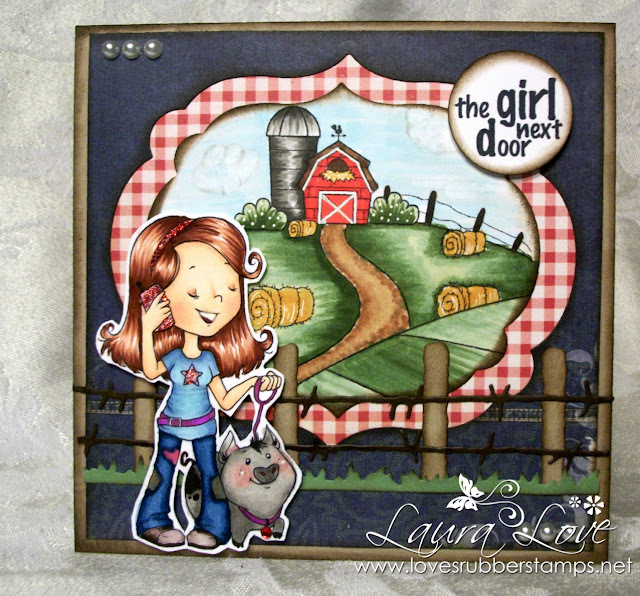 I wanted my card to have a "country feel" so I decided to ink up a Farm background stamp I had from There She Goes stamps. I cut it out with a Stampin Up! labels die and also created a frame in my background paper with a larger die from the same set. Nothing says Country to me more than Gingham Prints and it is also my favorite to use ...but I didn't want it to overpower the card, I wanted just a pop of it so I just layered it inside the frame. My Jeans looking Designer paper is from the Bo Bunny Prairie Chic paper pack and the Gingham Print is from the Simple Stories Summer Fresh paper pack. 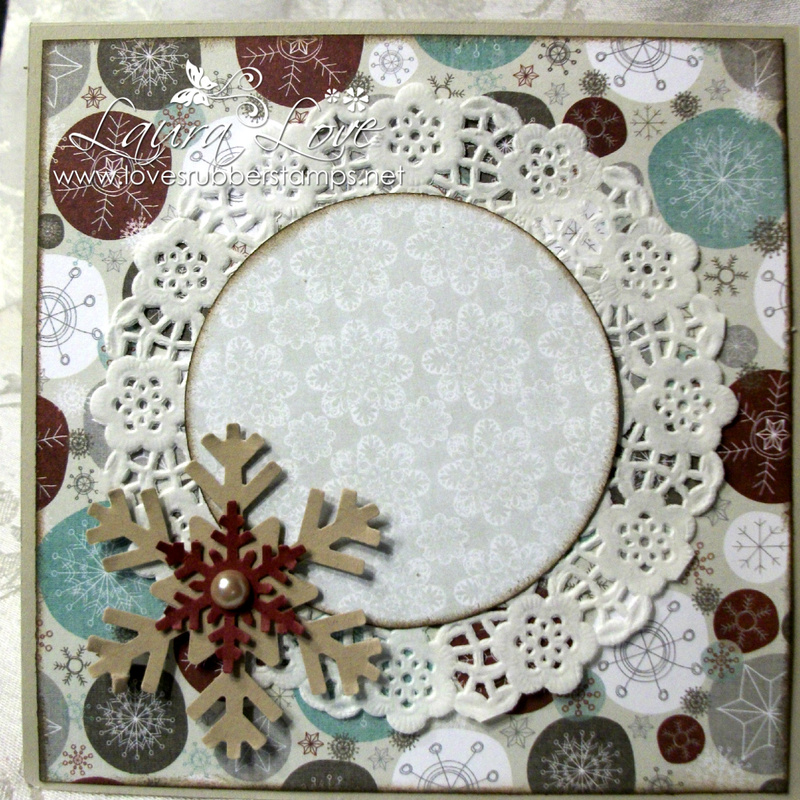 I also used the My Favorite Things Die-Namics Barb Wire Fence Die and the grass is from C.C. Designs Grass Border Die. And of course...you know me... I sponged everything with ...YEP... Tim Holtz Walnut Stain Distress Ink! LOL! That super cute sentiment is also a from the September Crafty Sentiments Designs release as well! Be sure to visit the Crafty Sentiments Designs Inspiration Blog to see what the other Design team members created using this image! Happy Holly Day Friday! Today is a Witchy Woman kind of day here on the blog - LOL! Be sure to check out my earlier post that features a Crafty Sentiments Designs Sneak Peek called Witch's Broom! Here is a super cute card from Holly today! I love the way Holly colored this and paired it with those awesome neutral colored Halloween papers! It really makes the image pop right off the card! I love the layout and the pops of black that separate the layers. 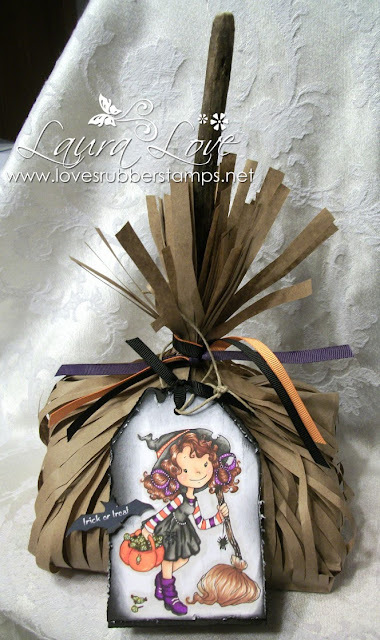 Looks awesome and is such a cute and fun Halloween project! Thanks for stopping by today! I hope you have a great weekend! Witch's Broom - Sneak Peek! 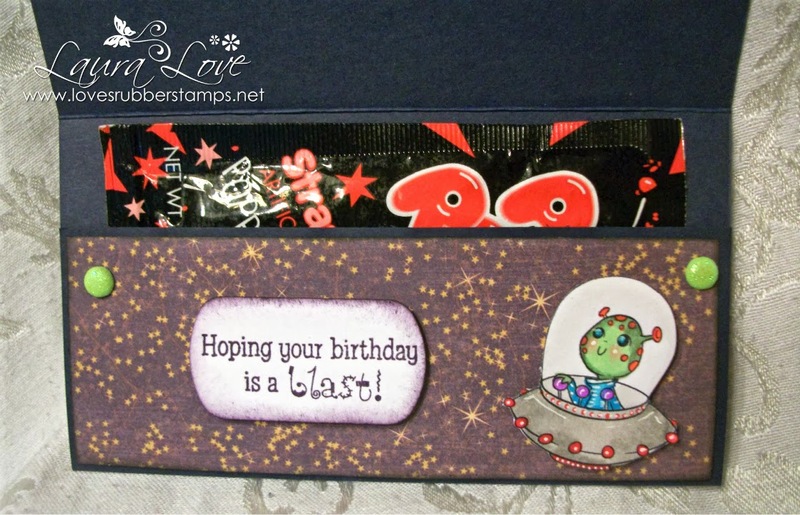 Welcome to DAY 2 of my Crafty Sentiments Designs Sneak Peeks! Today we are showcasing the super cute stamp called Witch's Broom. All the new releases will be available on September 22nd! 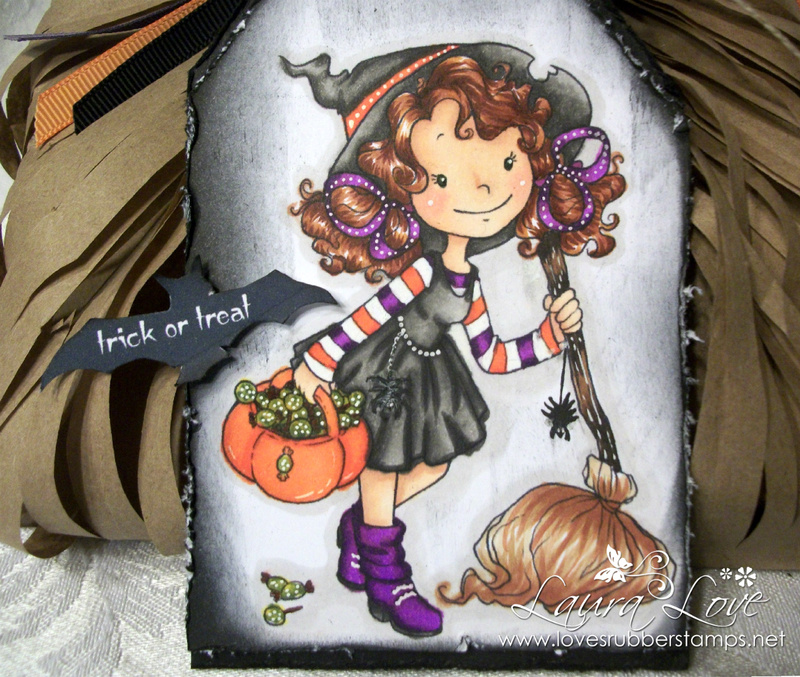 For the tag I just colored the Witch's Broom image with Copics and then sponged the edges with Tim Holtz Distress Ink in Black Soot. My little spiders hanging from the broom and on her dress I just hand drew in to make her a little bit spooky - LOL - I don't think it worked because my spiders don't look scary at all and one has 9 legs by accident - so it is a mutant spider - LOL! When you buy this image it will come without the spiders - LOL...even the mutant one! That neat bat is also one of the new Crafty Sentiments Designs Sentiments being released as well! Thanks for stopping by today! Be sure to check out my sneak peak from yesterday if you missed it...Me and My Dragon...and be sure to stop by tomorrow for Day 3 of the new release sneak peeks! 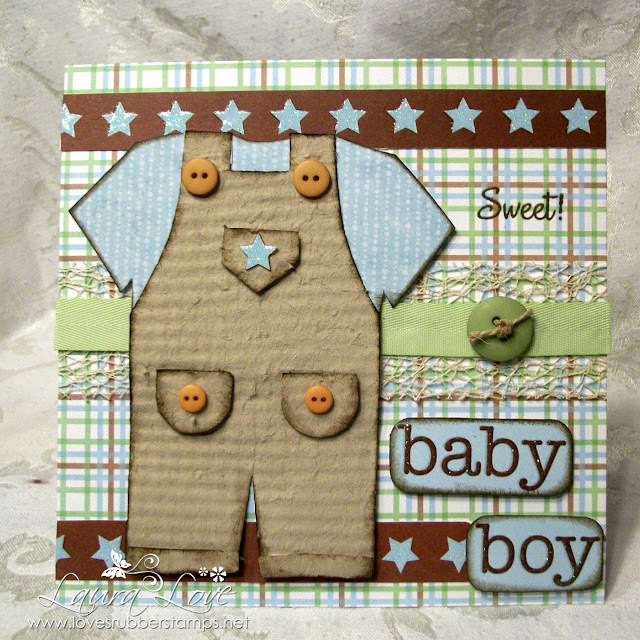 Be sure to check out the Crafty Sentiments Designs Inspiration Blog to see the other Design Team Members projects using this cute image! This beautiful card is created with the Penny Black Butterfly Symphony. I love the colors that Ceal chose and the splatters are awesome! She also used Copic Sketch Markers and Distress Re-Inkers to create this. I love the pastel purples and the teal together! Such a neat card! Be sure to check out my Crafty Sentiments Designs sneak peek of the new Me and My Dragon release! It is such a cute image! Me and My Dragon - Sneak Peek! 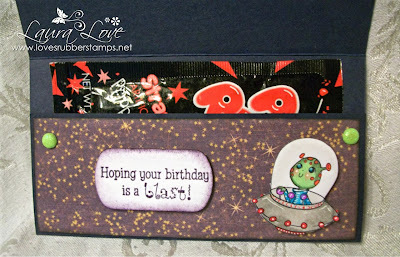 Today is the first of my sneak peek projects for the September Release from Crafty Sentiments Designs! You will see a sneek peak at a new rubber stamp that will all be available for purchase after September 22nd over the next 3 days! 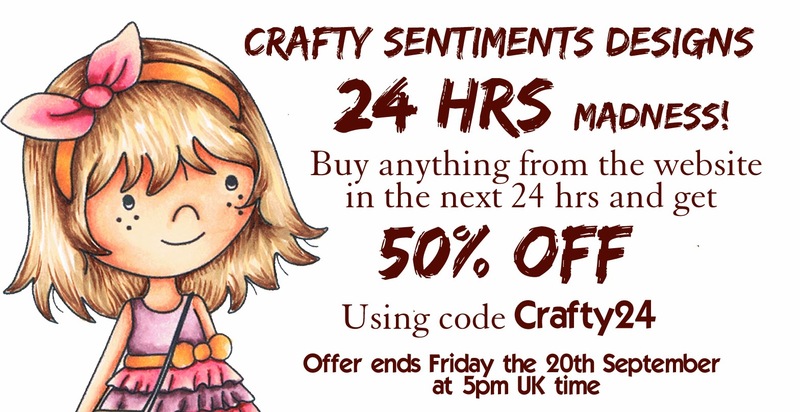 For buyers from our own store - I will be listing ALL the Crafty Sentiments Designs that we can get in a preorder so we can start sending in orders on a more regular basis. There have been so many new stamps released since our last order, and I want to add them all of course because they are so cute - LOL - so this will help me make sure we are getting the customer requests first! So be sure to watch for those! I will also send an email to our of our newsletter subscribers as well to let you know when they are in. Doesn't the little baby dragon have the SWEETEST look on it's face?!?!? :D For the layers on my card the lighter square is actually vellum. I tried to run it through my cuttlebug with a texture plate but it didn't work as well as I was hoping. You can't really see any of that in the pictures because it is very subtle and most is covered with my Designer Paper anyway. The Designer Paper is from the Bo Bunny paper pack called Prairie Chic. I had to sponge the edges with Tim Holtz Distress ink in Walnut Stain. I think EVERYTHING needs to have this sponged on it otherwise I think it looks naked - LOL - it is my addiction :) My flowers and pearl swirls are both from prima. I added some leaves using my Martha Stewart Branch punch and the flourish is called Fancy Flourish from My Favorite Things Die-Namics. 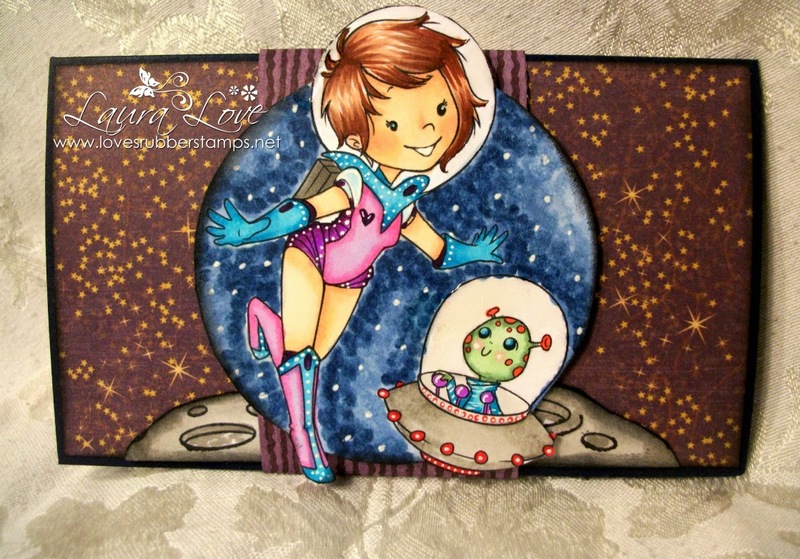 I colored the image with copics and sponged the edges of this panel with Stampin Up crumb cake. I distressed and then added Frantage to the panel and the sentiment. The frantage on the picture panel is called Shabby Blue and on the sentiment I used Shabby Pink. These actually come together in a pack of 5 colors in an embossing kit from Stampendous. Very handy, especially if you are just venturing in to the frantage world like myself so you get a great mix of colors! I was excited because the blue actually was the exact same shade as my teal copics! Perfect! :D The first few times I tried frantage I wasn't sure about it...but it is growing on me and I definitely love it when you are going for a more vintage or shabby chic look :) That gorgeous sentiment is also one of the new releases stamps from Crafty Sentiments Designs as well! I added the heart bling gem over the heart in the sentiment to give it a little pop. I hope that you enjoyed my little Dragon Card today! 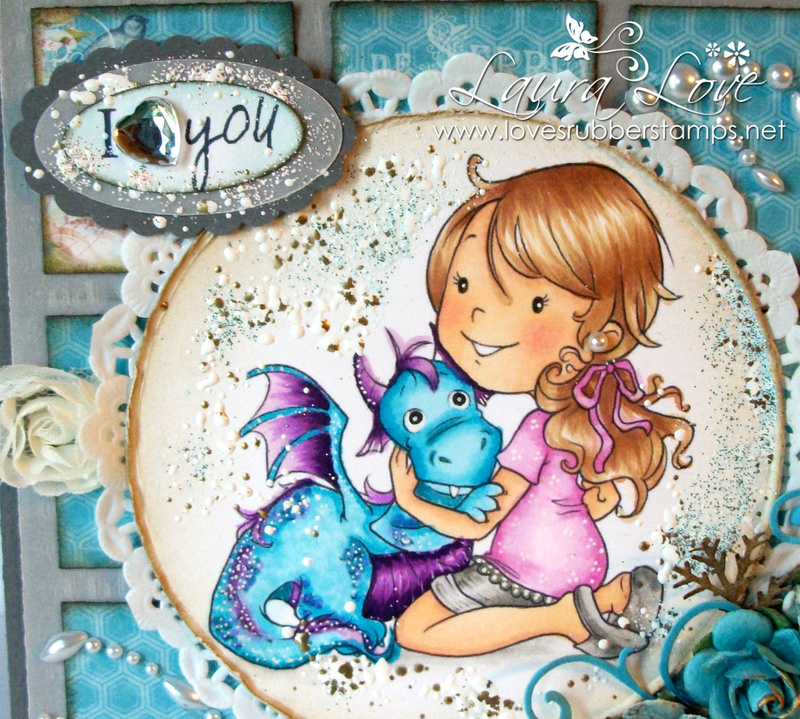 Be sure to visit the Crafty Sentiments Designs Inspirational Blog to see even more adorable projects using this Me and My Dragon image by the Design Team and some special Guest Designers! This week we could choose to use - the Overalls Shaped Card, The Funny Car Treat Box and Shared Card Set or the All About Boys Printable Stamp Set. I wanted to give my overalls some texture so after cutting the pattern out I ran it through my paper crimper about 7 or 8 times to break the fibers in my cardstock. I then smoothed it out and peeled it into two parts. This creates the fuzzy looking side which is what I wanted! I then used the other half to make my pockets. I sponged all the edges with Tim Holtz Distress Ink in Walnut Stain and the word Sweet! was stamped using the Wild For Watermelon stamp set from Flourishes. Later this afternoon be sure to visit The Cutting Café Blog to see all the Design Team Projects! Each week Regina draws one lucky winner who has left a comment to win 3 free files of their choice! I am bound and determined to get some Christmas Cards made this year that I can send - LOL! I am up to THREE!! YAY! That is a record I think!! I used the GORGEOUS Candy Cane stamp from Saturated Canary! This is one of my favorite favorite stamps! I decided to color her in soft teal blues and warm greys. I like how she turned out. I decided to make one of my panels look like a pretty vintage, wrapped Christmas Present. 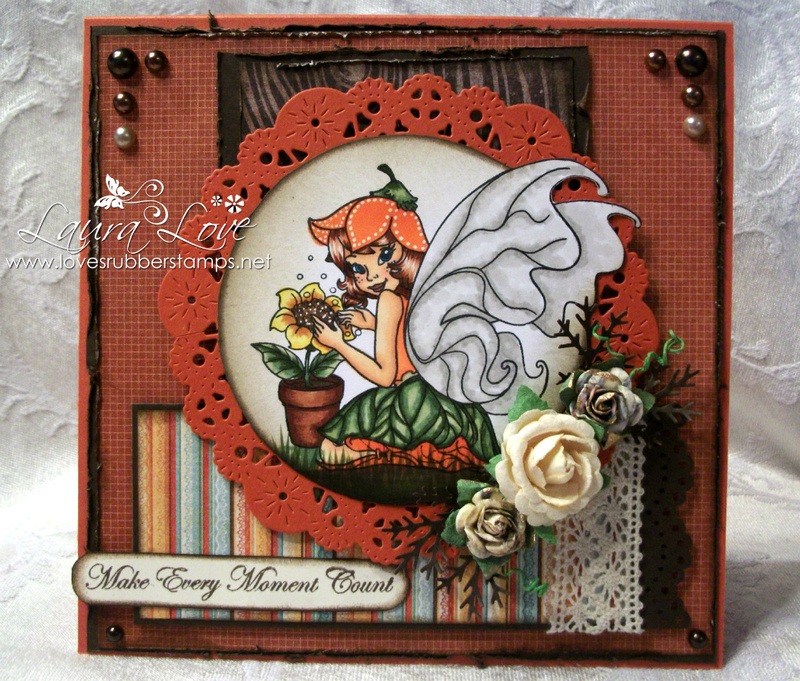 My Sentiment is from the My Favorite Things Seasonal Sentiments stamp set. This is actually one sentiment but I cut it apart to make it fit my card better. Here is a look at the inside of the card - which I kept pretty simple. 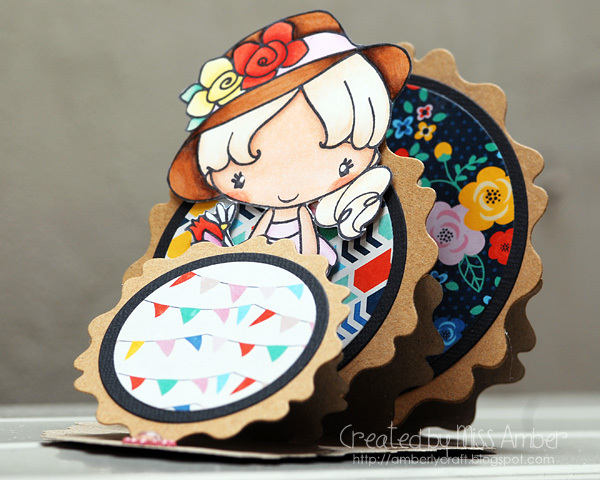 Be sure to check out my earlier post for this week's Crafty Sentiments Designs Challenge too! Thanks for stopping by and I hope you play along with us this week!! 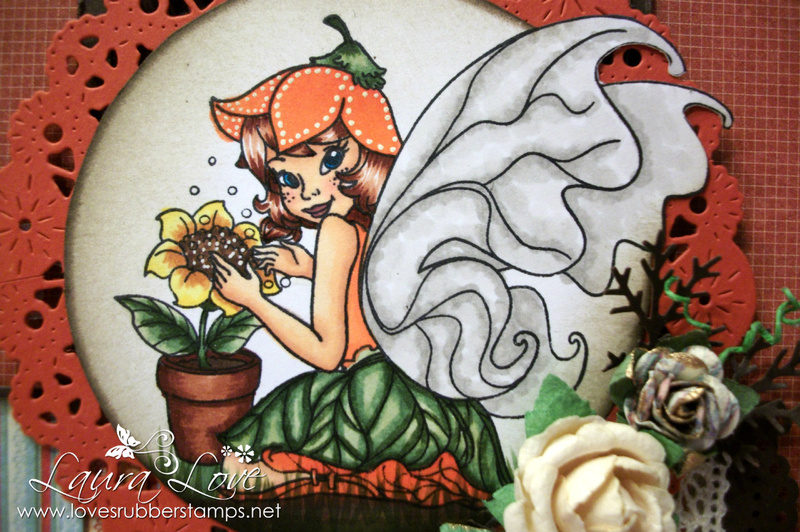 I used the super pretty rubber stamp called Vinca The Fairy. I colored her with a mix of copic markers and Spectrum Noir. The spectrums I used were for the oranges, all the rest were copics. I used the out of the box technique for the image and then mounted it on a burnt orange colored doily that I found tucked away inside a paper pack that I had purchased from a friend a long time ago. I added some prima flowers and used the Martha Stewart Branch punch to create some leaves. I kept the ends long on my two smaller flowers and then used my petal roller to make them curly for some added texture. I always envy those people that make the very elaborate floral displays on their cards...I can't do that at all - LOL! Three flowers seems to be my limit for figuring out how to place them so I like the look - LOL! I added a piece of scrap crochet ribbon and punched the edge of one of my layering panels with a Martha Stewart punch. 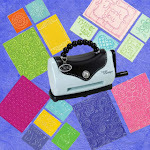 The sentiment I chose is from the My Favorite Things Flower Silhouettes Stamp Set. I hope to see you play along with this week! Have a great day and thanks for stopping by! Hope you all had a great weekend! My sister is back for only ONE DAY from Florida. She flew in yesterday for a funeral and then has to be back at the airport today by noon so I am trying to get a few things done early so I can go see her before she has to leave again. Then after that I plan on coming back home, finishing some blog posts and then working in the store the rest of the day adding some of the mountainous piles of inventory I have sitting around my dining room waiting to be entered in the store so I can put it away where it goes - LOL! I have a super awesome card to share with you today from Olivia! When I saw this I actually laughed out loud because it is so cute and funny and the image is PERFECT with this sentiment! LOVE it! Isn't this AWESOME!! LOL!! Olivia used the super cute Lucy's Broken Dolly from Make It Crafty and she colored her with copics. This is temporarily out of stock right now but we will be getting more in very very soon :) I think this is one of my FAVORITE stamps! The look on this little one's face is PRICELESS and anyone who is a parent has seen this face at least once from their child - LOL! Olivia paired this with one of the hilarious Riley & Company Funny Bones Stamps called Someone Told Me . LOVE this line of stamps - they are so funny. I just giggle and giggle when I read through them - LOL! Plus I will be adding many more to this line as well :) This is such a fun card! LOVE LOVE LOVE! I hope you have a great day! Thanks for stopping by today! Hope you are doing well this beautiful Sunday morning! It's time for the Sensational Sunday Winner to be drawn... This week the winner was chosen from Nicole's Blog! Congratulations to JoAnn who said: What a sweet card. Your coloring on the image is fabulous and I love the papers you used. Thanks for sharing it with us at Seize the Birthday. Congratulations JoAnn! You're name will be in the $20.00 Gift Card Drawing on October 6th!! My camera batteries have died on me and apparently my son stole my extra ones! I will be headed to the store later today to get some more so....until I can upload my project....how about a store coupon in it's place that is good for TODAY ONLY will expire at MIDNIGHT CST! Be sure to check out what the other Designers have for you today and check back here for my project later today after I get some more batteries ;) !! Don't forget to leave comments on all the blogs for the most chances to win to be in our drawing on October 6th!! Enjoy your Sunday and thanks for stopping by! 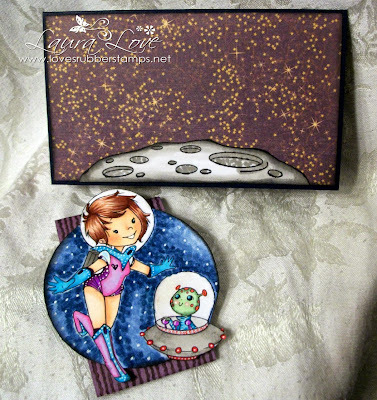 We have another AWESOME AWESOME video tutorial for you today by Indah! 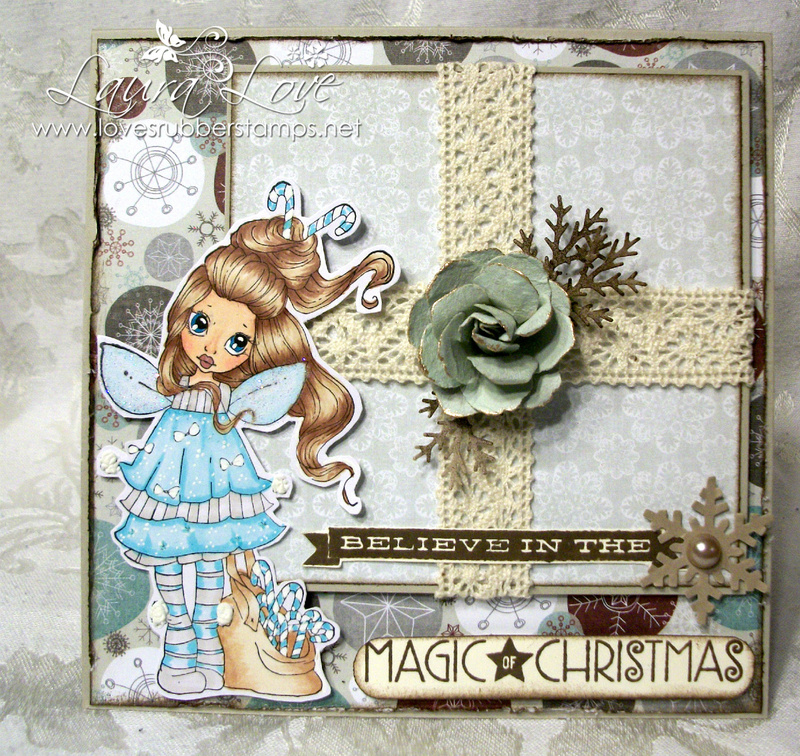 This week she is sharing with you how to create a Triple Easel Card! I was so excited when she said that this was her topic for this week because I have never made one and I think they are so neat looking! Here is a picture of the gorgeous card that she will be showing you how to create! Indah's beautiful card used the super cute Garden Anya from The Greeting Farm! I love the way Indah colored this image up and the papers are beautiful! 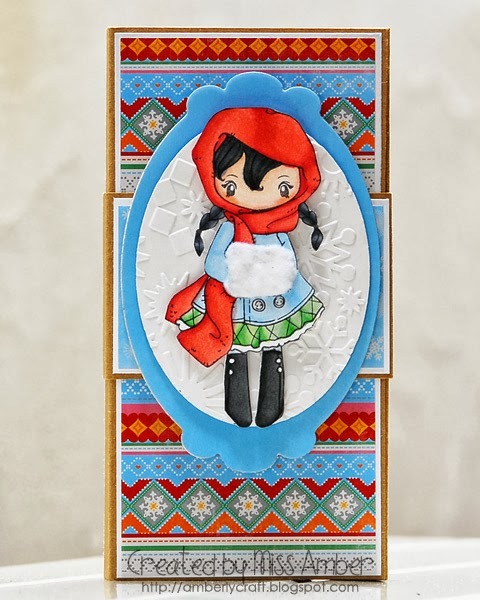 Here is the video on how you can create this stunning Triple Easel Card! Enjoy! Thanks for stopping by today and have a great weekend! And a Bottle of Rum! Happy Holly-Day Friday! I am excited because this is my REAL Friday too and I have 3 days off to get caught up on things after Super Nationals last week. Now that racing is over I told my husband that Saturdays will now be so boring with nothing to do - LOL! He suggested we go to a movie so we will see! Saturday is the Iowa/Iowa State game which is always a super busy night for the police department I work for, and they are hiring back personnel like crazy since it is in Ames this year...but lucky me ... I am off AND I am going to enjoy it :D I am not sure of I even want to brave going into town, will be a madhouse everywhere! 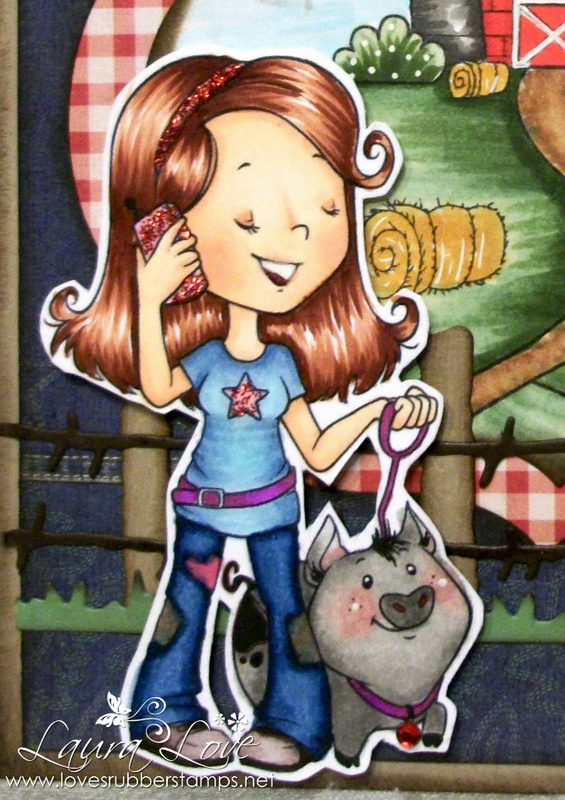 Enough blabbing by me :D Onto why you are here...to see Holly's super cute card that she has for your inspiration today! What an AWESOME little boy card!! I love how Holly paper pieced her pirate to match her cool designer papers! That little whale is so cute! I love the little pirate flag and the waves are perfect against the flourish designed paper! LOVE this one! Masculine cards are so hard for me and Holly totally rocked it! Sorry for the late post today..now this morning! I am really off my schedule today! 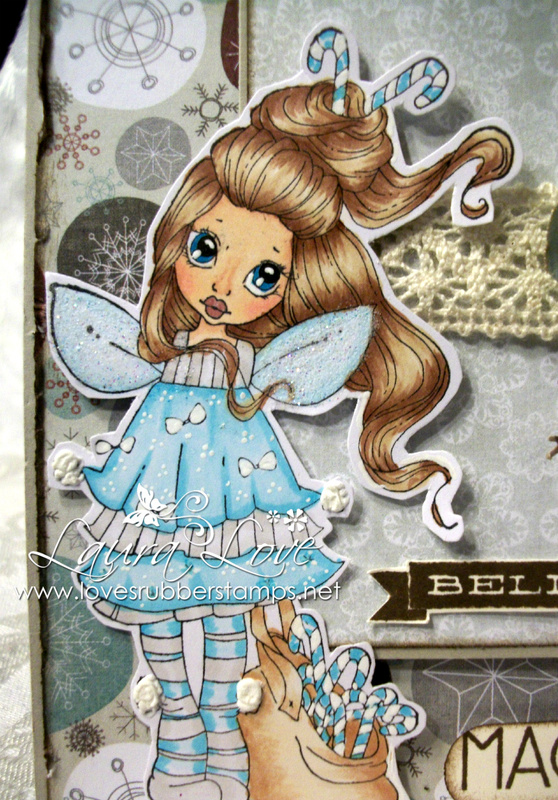 I have a super cute card to share with you from Ceal using some adorable Paper Smooches stamps! I think it is super cute! This card uses the Paper Smooches Stamp set called My Peeps, which we will have in the store very soon :) Ceal colored the little bird with Copic Sketch Markers. I love the embossing that Ceal did and the pop of teal with the white! That little cloud is adorable too! Love it! I always enjoy seeing Ceal's CAS designs because these types of cards are always so hard for me :) Thanks for stopping by today! Before I start my post I just want to say that my heart, thoughts and prayers are with all the families of those who were lost on 9-11. We will never forget that day! God Bless us all! Today is my Design team post day for The Cutting Café! This week we could choose one of three files to use - Apple Treat Box, Bus Shaped Card , or the printable stamp set called School Borders. 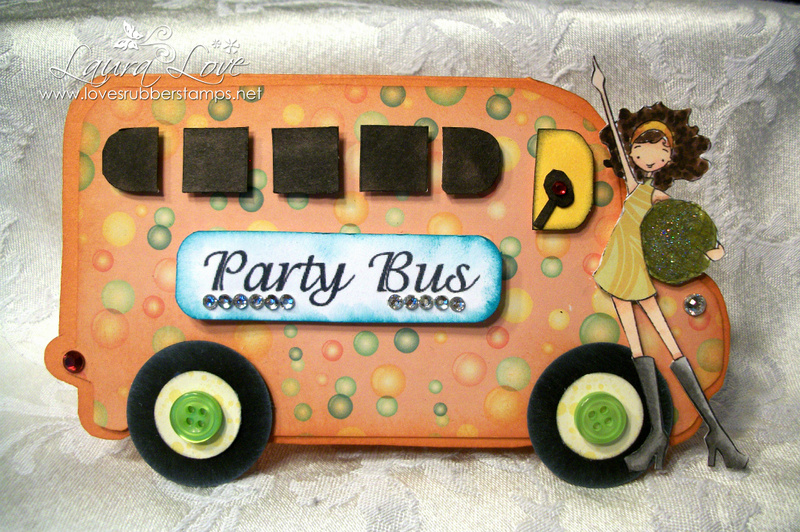 I don't do much in the way of back to school projects since my kids are older but I saw on the Bus Shaped Card that there were some fun sentiments that you can use anytime...like PARTY BUS...so that was the file I chose to work with this week! This project also fits our Loves Rubberstamps challenge this week to have a Sentiment on the Front! Easy Peasy so I hope you join us and play along with us! Later this afternoon be sure to visit The Cutting Café Blog to see all the Design Team Projects and remember when you leave a comment you could be the lucky winner of the weekly give-away! Hope your Monday was great! Sorry we are late, but that is like the story of my life! lol. I am one of those irritating people who shows up 10-15 minutes later than I'm suppose to. To know me is to love me, lol. My Best Friend used to pick me up for college events and she would always tell me that it started about 30 minutes before it actually did because she knew me, lol. And she was one of those people who was excessively early to events. So I think we compromised and found a way to meet in the middle. Anyway, this late but great scrap page was made by our very talented design team member, Olivia. Don't you just love the colors and fun layout? How about those dies she used? I LOVE it! All you need is something like this to really spark some creativity and some fabulous paper and dies. A big thanks to Olivia for giving us all some scrap page mojo and inspiring me to dig out all those stamps and dies I bought especially for scrap pages. Don't forget to look in on the Challenge Blog for our new Challenge tomorrow! 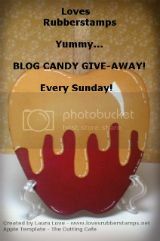 And be sure to scroll down and blog hop for a chance to win $20.00 from the store! Now that ones really easy. Thanks for checking in on us today.